Are you looking for an electric motor for your boat? 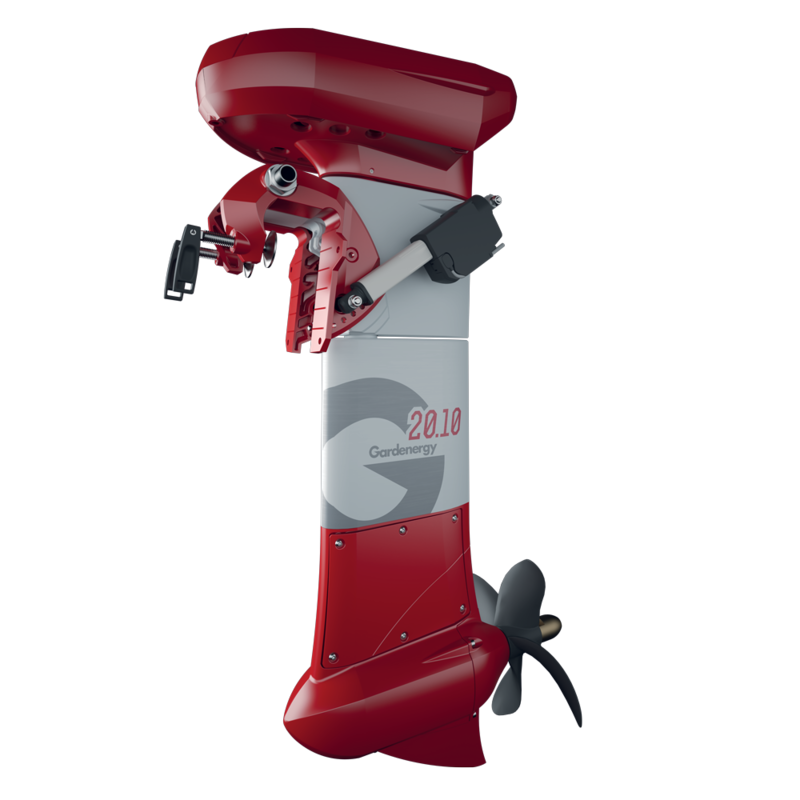 GARDENERGY was established to offer a simple and reliable product featuring cutting-edge technology that allows your boat to cruise in total silence while respecting the environment. Boat builders and shipyards seeking a high-performing, reliable partner for their electrical product. Gardenergy offers OEM supplies of electric inboard and outboard motors for new products and the retrofit market of engines by other brands and with different technologies. Private yachtsmen and nautical dealers seeking for a standard product that is also easily customisable in terms of performance and accessories. 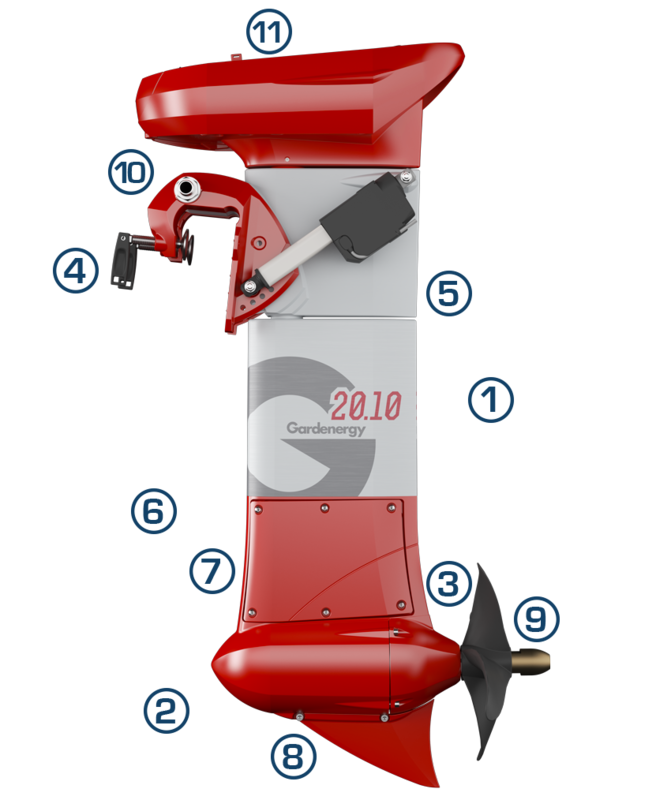 To all those who wish to convert their boat replacing an internal combustion engine with an electric one, Gardenergy offers the chance to easily adapt the new engine to the boat. The electric motor is a permanent magnet PMAC type, “brushless“, to ensure maximum efficiency and reliability in time. The power board is integrated in the motor for maximum ease of installation and performance during operation. Several power ratings are available from 1,000 Watt to 10,000 Watt with voltages from 24V to 48V. Gearboxes have not been used in the engine: in this way, there is a direct coupling between the propeller and the electric motor. This solution allows smooth running and maximum transmission efficiency. All engine components are made of aluminium alloy castings, which are then worked using CNC machines to guarantee perfect couplings, maximum durability in time and robustness in case of impact. The power-to-weight ratio is favourable and can exceed 500 Watt per Kg in the pod versions while maintaining all the power electronics integrated in the motor. The electronic power board is integrated into the motor housing, ensuring improved heat dissipation and maximum engine performance even at high ambient temperatures. The GE motors are all impregnated with a special resin and gel that protects the motor and electronic parts from water. 5 protective layers, including a thick epoxy resin layer, protect the engine against corrosion. The propeller connection system is a standard conical shaft, which, when necessary, can be easily replaced with compatible products. The standard steering is remote with cable. Two display versions are available: a LED version and a touch screen version. The electric tilt is an option that allows the motor to be raised from the water simply by pressing a button and without effort. The electric trim is an option that allows you to better adjust the throttle trim to make the most of the engine thrust with different load conditions and at different speeds. The Bluetooth system, integrated and mounted on board in the engine, allows interaction with all Gardenergy Apps with no need for cables and external interfaces. The Gardenergy app allows you to monitor the performance of your engine and to set different configurations according to the mounted propeller. The GPS system allows you to know the performance of your engine and of the boat on which it is mounted in real time. Thanks to the GSM module, you can also trace the routes covered and know the position of your boat at all times. There are 4 power outputs for different devices and accessories. Plug and play connection of devices is available without complicated external electrical installations. By simply pressing a button in the control system, you can enable different devices. 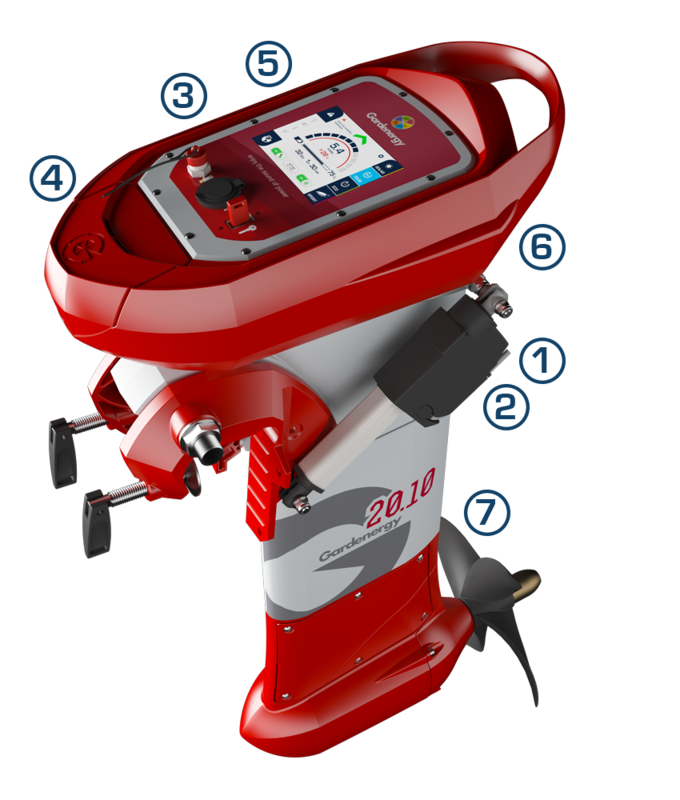 The optional bilge pump is activated by simply pressing a button in the control panel. The bilge pump is also available with a floater that activates automatically. The optional horn is activated by simply pressing a button in the control panel. The lights activate by simply pressing a button in the control panel. The stereo can be powered directly from the power output and is activated by simply pressing a button in the control panel. The 12V socket for external accessories is available on the outboard and in the remote console version. Thanks to the USB interface, you can charge different devices and external accessories. You can connect a photovoltaic panel directly to the outboard. Inside there is a charge step up regulator with MPPT that allows you to charge your batteries. When power increases, you can mount the anti-ventilation plate to avoid propeller ventilation and cavitation. 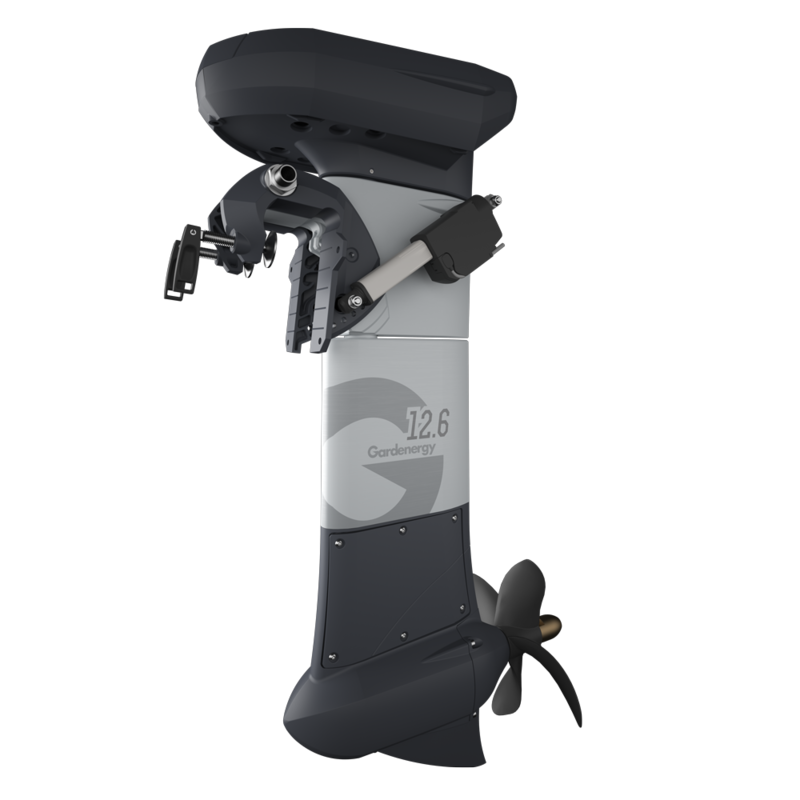 An OEM version of the engine is available also for shipyards and boat builders, allowing maximum customisation to satisfy different needs and uses for both planing boats and displacement boats. 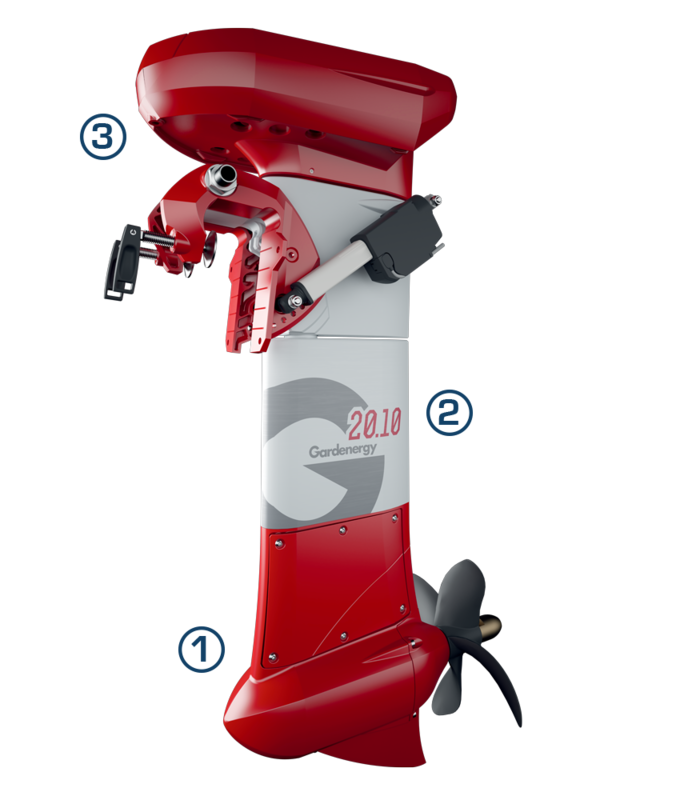 The engine in the OEM version is the ideal choice for those who want to do a retrofit of an old installation without having to renovate the whole boat. The height of the shank can be customised upon customer request to obtain the correct position of the propeller in the water according to the type of hull of the boat on which the motor is installed. The tiller of the engine is optional and, if requested, it can be customised with different sizes according to customer requests. Gardenergy motors are conceived, designed and built entirely in Italy. Starting from raw materials such as aluminium and thanks to latest generation CNC machines used for Gardenergy products, mechanics, electronics and computer science are combined to mix technology and unprecedented innovations. La realizzazione del fuoribordo GARDENERGY è stata finanziata sul programma Operativo FESR 2007-2013 della Provincia Autonoma di Trento anche con il contributo del Fondo Europeo di Sviluppo Regionale.